UDM Downloads > Sea Trapper! Take the role of an underwater explorer and trapper and get into the most mysterious parts of the ocean in Sea Trapper. Discover underwater caves of extraordinary beauty and unexpected danger. 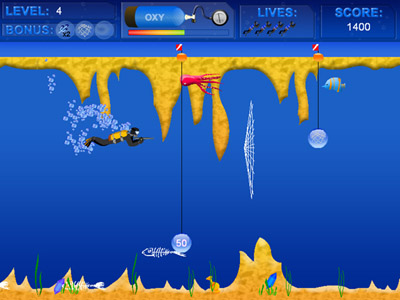 Your task is to collect as many different fish and other underwater creatures as possible. You get into an underwater cave at each level. You need a certain amount of oxygen to swim through a cave. You have a harpoon gun to catch underwater creatures. Sometimes you'll use a net. Gather treasures and jewels from the ocean floor. Various bonuses will give you additional weapons, speed and oxygen. Discover new sensations of diving and hunting! Join your counterparts from all over the world and beat your best score! If your score is in the Top 10, you can upload it to our Web site and thousands of other players all over the world will be able to see your high score! Are you up for the challenge? Download Sea Trapper and Play for Free!